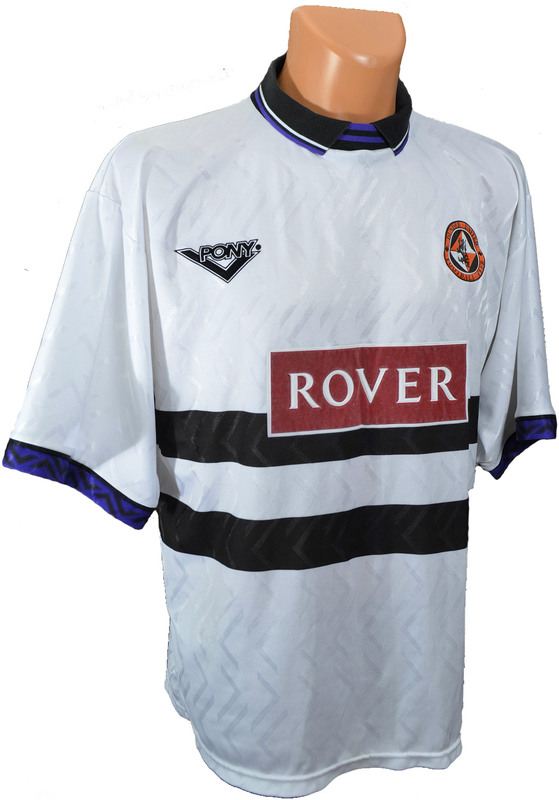 When the Loki deal expired in 1994, American sportswear brand Pony became the new kit suppliers for United when they began the 1994/95 season as Scottish Cup holders. The White away top had a very similar design to the Home shirt, with the zigzag pattern through the material, the bands at the cuffs, and the new polo style collar combined with the round crew neck. Two thick black bands passed horizontally across the middle of the shirt, reminiscent of the United kit from 1958 to 1962. However, there was a new colour added to the United kit for the first time, with the cuffs being a bright purple, which was also included in the neck line. Just like the Home kit, the shorts kept the same design as the top, with the zigzag pattern, and the thick black band at the legs. Again, they were longer than had been seen for a long time, as was becoming the style during the mid 1990s. The socks were white with black trim. As was becoming a bit of a habit with the Away kit, it made its debut against Hearts at Tynecastle, where this time United lost 1-2 in September. A mediocre season ended in disaster, when, after losing nine of their last eleven League games, United were relegated from the Premier Division for the first time since it began in 1976. Both the Home and Away kits were retained during the 1995/96 season, as United battled to get back into the Premier Division at the first time of asking. The Away kits last appearance was the first leg of the Premier Division Play-Off against Partick Thistle at Firhill, where Christian Dailly scored a valuable late equaliser.